Third party settings are integration with EasyCart that we include with our plugin. While most third party systems are developed as extensions in EasyCart, several we add directly into our software due to complexity or need to integrate directly. This panel will only appear if you are a Premium member and have installed the Facebook & Instagram extension plugin. This plugin will allow you to sell and feed Facebook with your products into their custom Catalog system. Click Here to learn more about the Facebook & Instagram extension. 4 Part Tutorial Video - Click Here! We have a full 4 part series of videos to help you install pixels, plugin, create catalogs, and create ads! 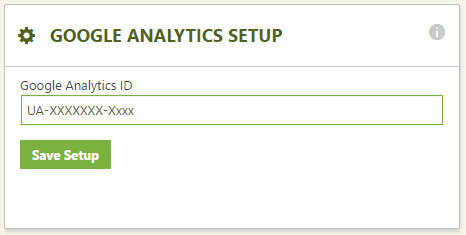 Enter your Analytics ID in this location will enable eCommerce transactions to be sent to google analytics for analysis. 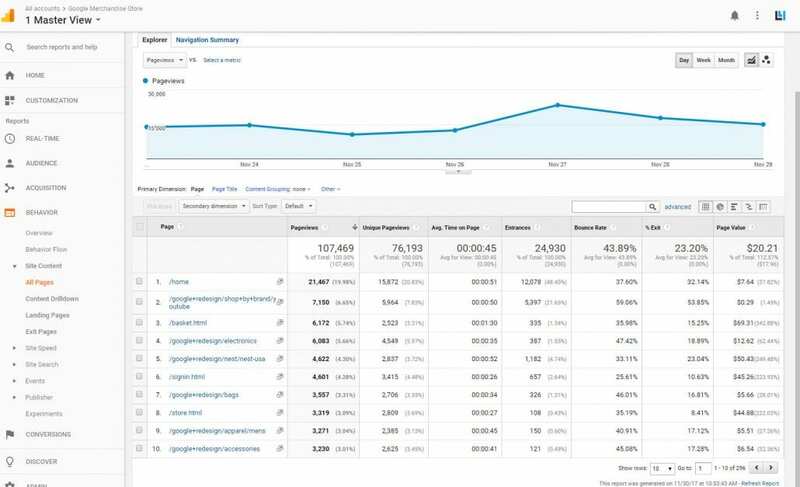 Please note that this does not enable google analytics page statistics on every page in your website. Note: You should download one of the many free plugins or place in your theme the page settings code for google analytics. What this section does is enable transactional data be sent, which is of great importance when included in your google analytics data. You can learn what products sell most, where the customers come from, what they view, etc. This report shows the acquisitions of users coming to your site, their behavior, and with ecommerce data enabled, you can see the conversion rates of each acquisition path. This report is an example of customers behavior on your website. You can look at each page and determine the value that it brings to your website by looking at the Page Value column. This tracks visitors who view the page and those who actually purchase. 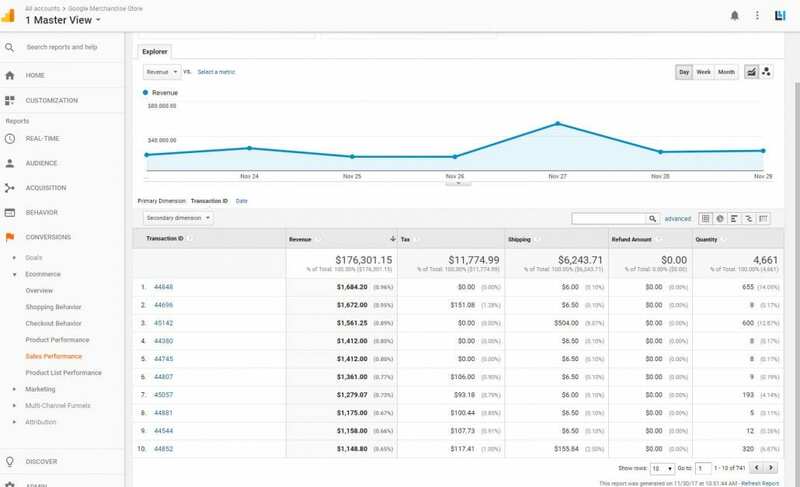 Google analytics also provides conversion data for products. Here we see what your top selling products are along with avg Price, avg Quantity, and total sold of each item over a given time period. This report will show you order numbers of and totals for a given time period. 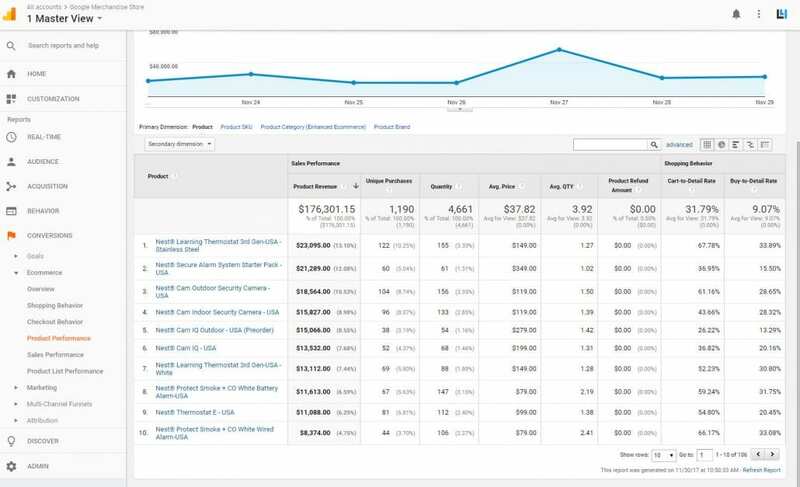 Useful sales performance data is found in nearly all analytic categories of Google so you can see how helpful various areas and aspects of your website are performing. 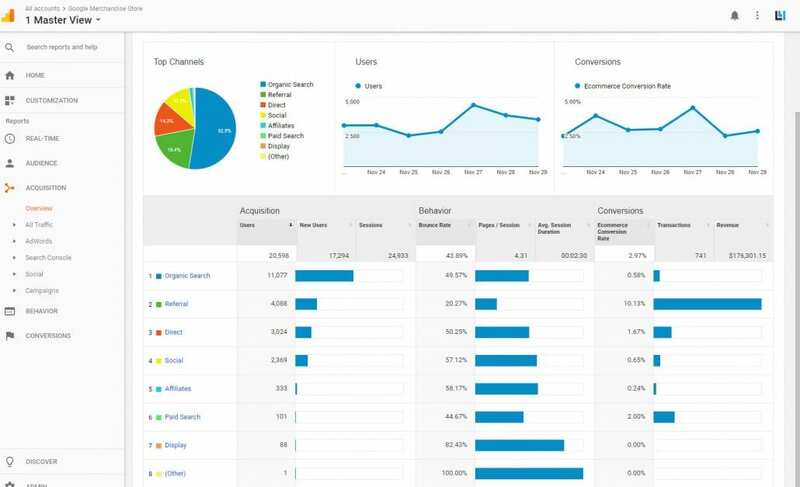 The data also lets you perform useful marketing tools and which referral areas you should target more or less. 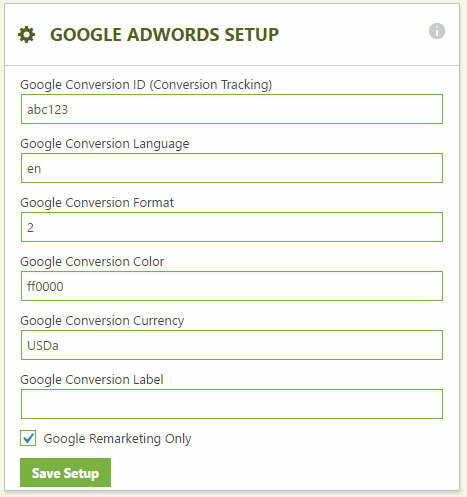 Setup google adwords conversion data based on your adwords account. Now your data will track back to adwords so you can establish which ads are converting customers and which are not. You may check the ‘Google Remarketing Only’ section to track the data only at the remarketing level. Google Merchant setup allows you to create and import your products to a google merchant feed. Part of the process is within EasyCart, part of the process requires you to complete google specific fields before importing. Follow the above steps found in your third party settings page to create a CSV file. You will need to add your GTIN, MPN and other google fields before re-uploading your CSV file in step 2. 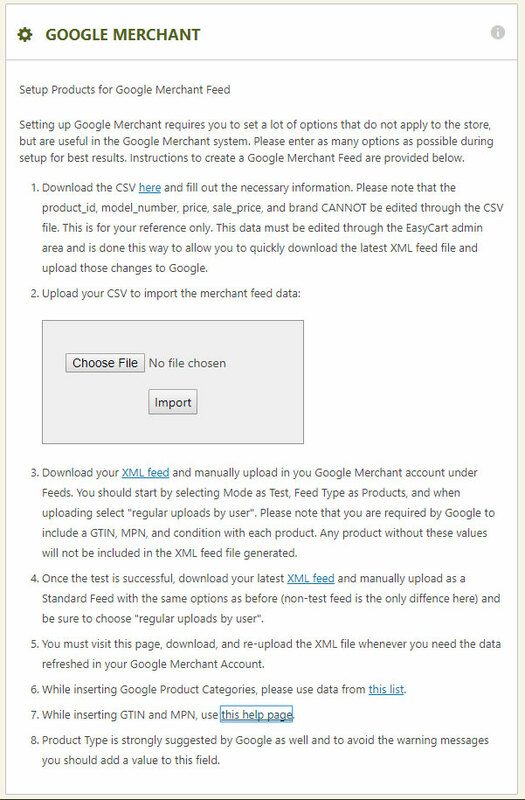 This will allow you to download a new XML feed file that you can import into google merchant as a test feed. Once you are happy with the results, you can import your products as a regular live feed. Please read the instructions fully and follow the steps given to complete the process. Facebook pixel allows you to send custom events from your website to facebook to track pages, conversions, and other events. WP EasyCart is already integrated to send custom events for shopping to facebook. Simply enter your facebook pixel ID and you will start tracking Page View, Add Payment Info, Add to Cart, Initiated Checkout, and Purchase events. Please note that this does not enable Facebook page statistics on every page in your website. Note: You should download one of the many free plugins or place in your theme the page settings code for facebook pixel. The EasyCart Pixel integration primarily is only going to track specific events related to products and checkout. EasyCart is integrated with Amazon S3 to allow downloadable goods to be served from the powerful Amazon servers rather than your web hosting server. This is a great solution for those who offer large download files, music, or movies that would consume important web hosting bandwidth and resources. The customer would access their downloadable purchases the same way, but the products would be served from Amazon rather than your host. 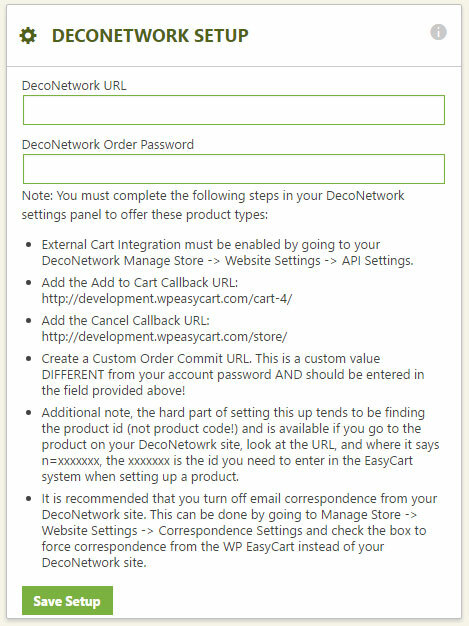 EasyCart integrated with the DecoNetwork to offer customizable products using their powerful configuration software. tshirts, mugs, sweatshirts, etc. can all be customized through the DecoNetwork configurator in a few easy steps. First, setup your information below, along with a few settings you must setup at DecoNetwork. Once communications are established, you can configure products by specifically saying they are DecoNetwork products and EasyCart will take customers to the configurator when they choose to customize a product.